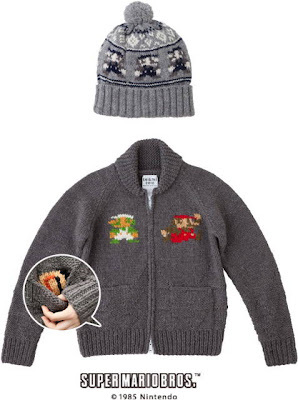 The website run by Earthbound/Mother creator Shigesato Itoi will soon offer up for sale (in Japan) the above-mentioned wool hat as well as an all-wool, hand-knit sweater that features Mario and Luigi sprites on the chest and coin sprites inside the pockets. Hefty price tags will be attached to both products, according to andriasang.com, with the hat selling for ¥12,000 (about $140) and the sweater selling for ¥36,000 ($422). Oh. Em. Gee. The coin inside the pocket is such a brilliant idea! I would love to have the hat. The sick part is, there is people who are die hard enough to buy it. Oh, I'm sure you're right, Luminairis. Personally, I'd buy the hat if it were, like, $30 or so, but $140 is a bit steep. Anybody with any idea of the work that goes into this type of knitting, known as intarsia which means "color painting", will understand that it's actually a reasonable price, considering the man-hours put into the creation of the piece. Thanks for the input, anon. If I were more wealthy than I am, I'd gladly pay anything for these items, and they definitely seem to be of high quality. As it stands, though, I'm just going to admire them from afar.